There’s nothing quite as quintessentially British as roast beef. As early as 1748, William Hogarth was using it to taunt the French in his paintings, with ‘O the Roast Beef of Old England’ portraying Britain’s wealth and power via a huge chunk of beef; a scrawny Frenchman nearby tucks into a meal of onion soup. During the Industrial Revolution beef became a symbol of wealth and national identity among the emerging middle classes, to the extent that the French coined the apparently insulting sobriquet ‘les rosbifs’. But perhaps it’s time the nickname changed to ‘les ros-chicks’? 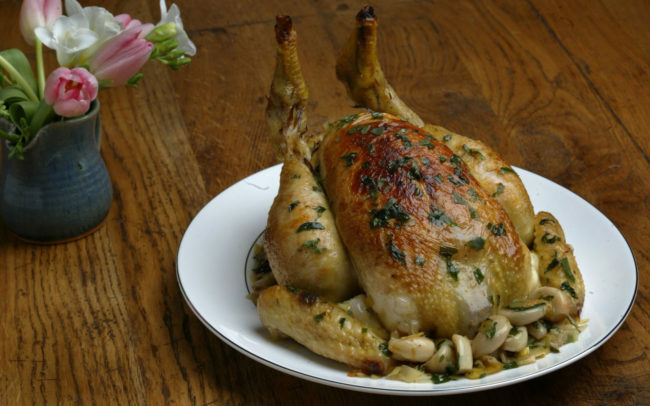 According to a recent poll, chicken has replaced beef as the nation’s favourite roast meat. The research, by ice cream manufacturers Kelly’s of Cornwall found that 28 per cent of 2,000 respondents prefer roast chicken, with 25 per cent flying the flag for beef. A third of us still eat a roast once a week, with three-quarters seeing it as a vital weekly tradition. For 93 per cent, a Yorkshire pudding can be eaten with any meat, not just beef. This shift evidently hasn’t been acted upon by certain establishments, as a recent pub I attended served yorkies as standard with beef, while charging extra when paired with chicken. Young people are driving the change, with 36 per cent of 16-29 year-olds preferring chicken – only 18 per cent of over 45s say the same. Men are more keen on beef than women, according to the research. What’s driving the shift from beef to chicken? Price is certainly a factor, with many citing the relative affordability of chicken as an incentive. Others see it as easier to cook, more versatile and a better provider of leftovers (further meals can be created from the bones, for example). Concern for the environment may be a factor too, as cattle farming has a greater negative impact than poultry, while chicken is also seen as a healthier option. Radio producer Caroline Ferguson thinks chicken is “much juicier, and it goes better with all the trimmings. Crispy chicken skin is delicious, while beef skin is rank.” Many I spoke to insisted chicken gravy is better than beef gravy, while most also claimed chicken is more tender than beef, which is seen by some as “far too dry”. And what about the chefs, those turning out fancy roasts when we’re too lazy to make our own? Chantelle Nicholson, chef patron at Tredwells and executive chef & operations director for the Marcus Wareing group, says beef still tends to be a more popular order – perhaps because we see it as harder to make at home, so opt for it when in the hands of a trusted chef. And what of lamb? Only 18 per cent would choose roast lamb over all others. Though its strong taste puts some people off, to me it’s by far the most flavourful and tender, is incredibly easy to cook and has excellent sauce potential.